In the early design of compressors and turbines, it was of importance to locate the rotor critical speeds so as to insure that a turbo rotor would not be operating at a critical speed. As compressor and turbine design became more sophisticated, a more detailed analysis of the rotor damped critical speeds and rotor log decrements was necessary. With compressors and turbines operating at higher speeds, under high power levels, and at multiples of the first critical speed, the problem of stability or self-excited whirling is of paramount importance. The onset of self-excited motion may lead to large amplitudes of motion with possible destructions of the rotor or the inability of the compressor to operate at peak power levels. Encountering this phenomenon with a compressor on an off-shore oil platform can mean millions of dollars of lost production. Self-excited whirling can be caused by fluid-film bearings, seals, Alford-type cross-coupling forces, or internal shaft friction, to name a few of the excitation mechanisms. The problem of computing the approximate values of the rotor log decrement under full speed and loading conditions requires the solution of a complex eigenvalue problem. The computation of the rotor complex roots is an order of magnitude more difficult than the problem of undamped critical speed calculations. J. W. Lund presented the first practical numerical procedure for computing turbo-rotor log decrements. The mathematical transfer matrix method pioneered by Lund has allowed industry to develop and stabilize a vast array of rotating machinery leading to the savings to industry of millions of dollars. Without the procedures of Lund, for example, it would not have been possible to resolve stability problems encountered with both the hydrogen and oxygen space shuttle pumps. 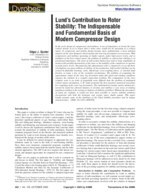 This paper briefly presents some of the attributes of the Lund stability procedure and its unique characteristics.